Zementis, Inc. is a company that makes software for the operational deployment and integration of predictive analytics and data-mining solutions. Its main products are the ADAPA Decision Engine, a platform for statistics and data processing, and the Universal PMML Plug-in for Hadoop and in-database scoring. The name Zementis, symbolizing "concrete thoughts", is derived from the German word Zement (cement, concrete) and the Latin word Mentis (thought, intellect) and relates to the company's core competence in machine learning and AI. Founded in 2004 with the goal of providing predictive analytics to the marketplace, Zementis is composed of two main divisions, analytics and engineering. 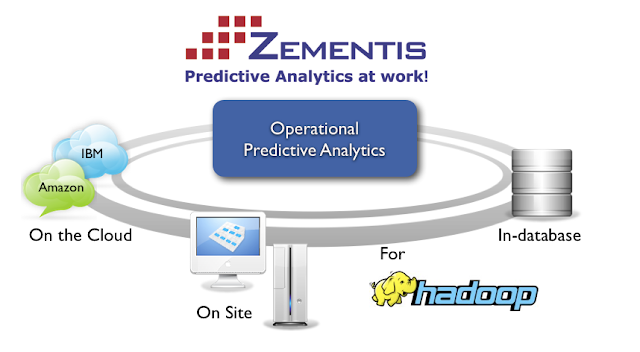 Although it started as a company focused on building predictive models, Zementis scientists soon realized that their models needed a platform in which they could be easily deployed and managed. From this need, the ADAPA Decision Engine came to be. ADAPA initially supported only neural networks, but it soon became a platform for the deployment of a myriad of statistical techniques as well as data processing (download the ADAPA Product Datasheet for a list of supported techniques). From its inception, ADAPA has been based on open-standards, including PMML, the Predictive Model Markup Language. As a member of the Data Mining Group (DMG), the committee defining PMML, Zementis has helped shaped the standard as it becomes the necessary vehicle for the sharing of predictive solutions between applications. In 2008, ADAPA was launched as a service on the Amazon Elastic Compute Cloud (Amazon EC2) and is currently being used worldwide by companies and individuals who want to execute their predictive models and decision logic. In 2012, ADAPA cloud offering was extended to the IBM SmartCloud. In this way, IBM provides companies around the world predictive decisions when and where they are needed. The Universal PMML Scoring Engine is also available for Datameer for scoring in Hadoop. Zementis HQ is located in San Diego in California. It also has an office in Hong Kong for servicing clients in the Asia-Pacific region. R. Nisbet, J. Elder, and G. Miner. Handbook of Statistical Analysis and Data Mining Applications. Academic Press, 2009. A. Guazzelli, M. Zeller, W. Lin, and G. Williams. PMML: An Open Standard for Sharing Models. The R Journal, Volume 1/1, May 2009. A. Guazzelli, K. Stathatos, M. Zeller. Efficient Deployment of Predictive Analytics through Open Standards and Cloud Computing. The ACM SIGKDD Explorations Newsletter, Volume 11/1, July 2009. A. Guazzelli, T. Jena, W. Lin, M. Zeller. The PMML Path Towards True Interoperability in Data Mining. In Proceedings of the 17th ACM SIGKDD Conference on Knowledge Discovery and Data Mining, August 2011. A. Guazzelli, W. Lin, T. Jena (2012). PMML in Action (2nd Edition): Unleashing the Power of Open Standards for Data Mining and Predictive Analytics. CreateSpace.